Designed in modern style and durability, this Bestar computer desk is a perfect addition to any contemporary office. This piece comes designed with a classic red finish, perfect for pairing with a variety of decor. The manufactured wood material will offer sturdy and reliable support for years to come. Keep it compact and organized with this desk, and still have enough room to store a computer, notebooks, and more. Desk Type: This computer desk is a great choice for your home office or computer room, providing ample room for your laptop, desktop, or anything else you need to work. Drawers and keyboard shelf on ball-bearing slides for smooth and quiet operation. It ships in multiple boxes. A clean office space allows for creativity to flow and projects to be completed, and this desk will be the catalyst of your success. 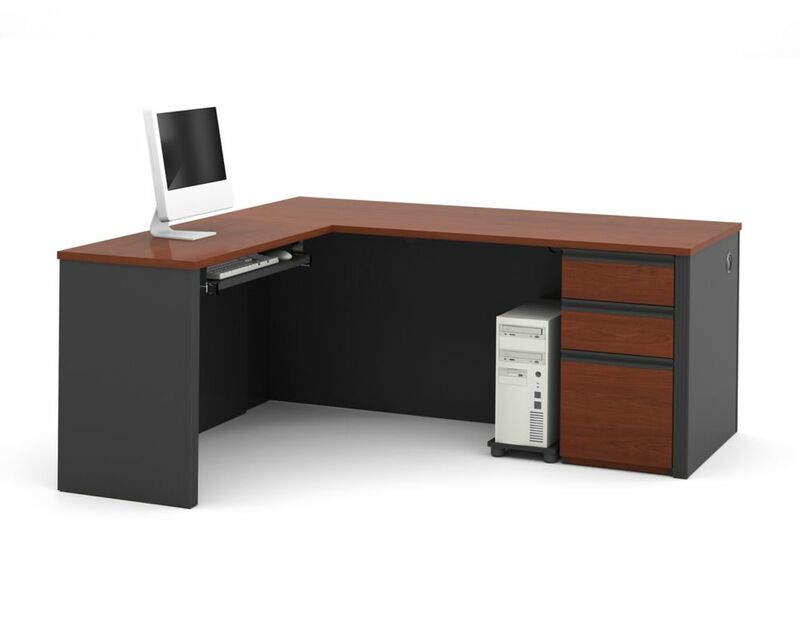 Its tiered design integrates a tempered glass desktop and a keyboard glider with a dropped inserts to store small office supplies. The deep, rich finish will blend easily into your existing dicor. Let this L-shaped corner desk / workstation inspire you with its practical and modern industrial aesthetic. It starts with a smooth laminate finish on all sides in a chic grey wood-grain finish accented with strong black metal framing. The numerous storage options include a wide drawer on metal glides with a sturdy black plastic handle alongside an open cubby, and two fixed bottom shelves for books, magazines or even a small printer. The side station is so useful with 3 spacious cubbies on top for all your work essentials. Assembly is required. Side station is not reversible. The trendy and industrial look of this "L" shaped computer desk will be the focal point in your modern home office. This simple and stylish desk features thick panels and clean lines in a warm grey wood grain look. The desk portion offers a spacious work surface that is great for doing paperwork or working on your computer. It also features two medium storage drawers and a convenient lateral file drawer on metal glides to help keep you organized. The secondary surface can be assembled on the left or right hand side of the desk and offers additional workspace with adjustable shelves. The black handles and feet boldly accent this L shaped desk making it a must have for any home or office space. Create the perfect office/work space with this computer desk from the Camden County collection. Its spacious tabletop provides you with room for all your office essentials computer, printer, paper and more! It features a keyboard/mouse shelf, a file drawer to hold letter-size hanging files, and a dedicated storage area for a vertical CPU tower. Finished in a classy Planked Cherry, this practical desk is just what you need to get the job done. Prestige + 71.1-inch x 30.4-inch x 69.2-inch L-Shaped Computer Desk in Red Designed in modern style and durability, this Bestar computer desk is a perfect addition to any contemporary office. This piece comes designed with a classic red finish, perfect for pairing with a variety of decor. The manufactured wood material will offer sturdy and reliable support for years to come. Keep it compact and organized with this desk, and still have enough room to store a computer, notebooks, and more.